Former Sen. 'Fritz' Hollings, 97, Has Died Hollings, who died early Saturday, served more than 38 years in the U.S. Senate, making him the eighth longest-serving senator in the country's history. 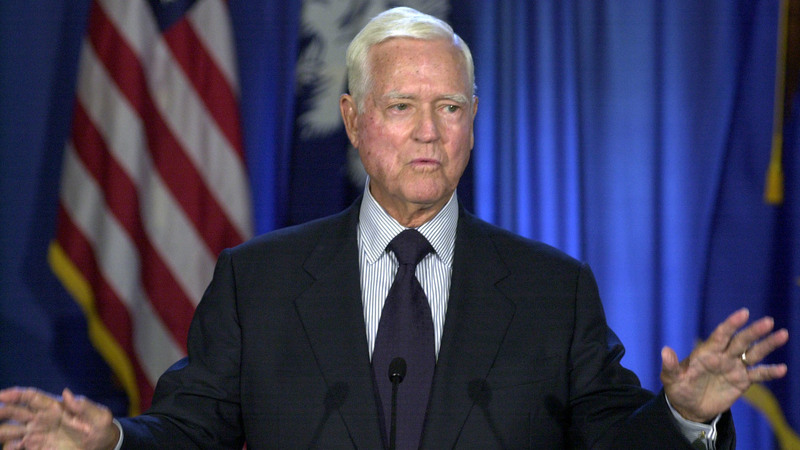 Former Sen. Ernest "Fritz" Hollings, pictured here in 2003, died early Saturday, according to a former staffer. "He was kind of ahead of his time," Hartell said. "He was always focused on the essential needs of the country: competitiveness of the economy, the balance sheet of the country from a budget perspective. And as someone who was a World War II veteran who served his country as a 20-year-old in North Africa and Europe, above everything a patriot." Hollings was born on Jan. 1, 1922 in Charleston, S.C. He graduated from The Citadel Military College in South Carolina and served as a combat soldier in the U.S. Army from 1942 to 1945. After returning home and earning a law degree, Hollings was elected to the South Carolina legislature in 1948. Hollings went on to serve as governor of South Carolina from 1959 to 1962, during a time when school desegregation was a major issue for the state. Hollings, according to The Washington Post, originally ran on a platform opposing desegregation but ended his term by urging the state legislature to accept integration of public schools. According to the Charleston Post and Courier, Hollings defended South Carolina's pro-segregation position as a lawyer in a case that would later become the state's entry into Brown v. Board of Education. Later, in 2015, he asked for his name to be removed from Charleston's federal courthouse, to be replaced by J. Waties Waring, a judge who declared forced segregation to be unconstitutional when few others in the Deep South were willing to do so. After he finished his gubernatorial term, Hollings returned to politics in 1966 when he ran for senator in a special election. He won that election, and went on to serve in the Senate for just over 38 years, which makes him the eighth longest-serving senator ever. But he was actually an extremely senior "junior senator" for much of that time, because he served alongside South Carolina Sen. Strom Thurmond, a segregationist whose Senate career lasted 48 years. Hollings is known for his work on hunger: He wrote a book on the topic, toured the country to speak about the issue and also co-authored the legislation that created the Women, Infants and Children program in 1972. WIC was piloted in that year as a supplemental food program aimed at improving the health of pregnant mothers, infants and children and was later expanded. "He was the father of South Carolina's technical school system, which is the envy of the nation," Sen. Lindsey Graham, R-S.C. said in a statement Saturday. "He led our state through the travails of the Civil Rights Movement with dignity and went on to become one of the most effective Senators to ever serve." Kirk Victor, who collaborated with Hollings on his memoir, told NPR's Weekend Edition the senator's "sharp, acerbic tongue sometimes got more coverage than his accomplishments." Hollings spoke his mind about people — often to their faces. On live TV, during a debate for the 1986 Senate campaign, Republican candidate Henry McMaster asked Hollings if he would be willing to take a drug test. Hollings famously fired back in his memorable southern drawl, "I'll take a drug test if you take an IQ test." And it seems like Hollings preferred for others to be direct, too. He told The Herald of Rock Hill, S.C., that his 1998 Republican challenger Bob Inglis was "so oozing and goozing and such a nice little choirboy and so pleasant, and everybody's rude, and he wants to be courteous." Then Hollings added, "He is a goddamn skunk. I can tell you that right now." Sometimes his attacks were offensive. The Associated Press reported that he once called Sen. Howard Metzenbaum, an Ohio Democrat, the "senator from the B'Nai B'rith." Hollings also reportedly used the racist term "wetbacks" to refer to campaign supporters of Alan Cranston, a former Democratic senator from California. Hollings did not retire from the Senate quietly. In his 2004 farewell address, he scolded his colleagues for deficit spending. "Rather than seeking the truth, we've been obscuring it," Hollings said. "We're spending $6oo billion more than we're taking in." In that same speech, Hollings decried the influence of money in politics. "The cancer on the body of politics," he said, "is money. Money, money, money." "I'm sick of raising money to get re-elected," he told 60 Minutes before he retired. "So I'm going home to Charleston."